Summer Sausage has always been a favorite finger food of mine during the holiday season. I’ve tinkered with recipes before, but haven’t felt like I’ve nailed them – until now. Folks, we can now eat Summer Sausage – worry free. High fives all around! No MSG, no nitrites, no preservatives. Actually, salt is a natural preservative, so I guess I can’t say “no preservatives.” But the least of my worries is sea salt, especially when I use Redmond. That means that “summer sausage” and “good for you” can be used in the same sentence. Yay!!! I think you’ll be as excited about this recipe as I am. It’s homemade beef summer sausage!! You will not believe how crazy easy this is to make. Mix all ingredients together in a bowl, squishing with your hands until everything is well combined. Cover and refrigerate for 24 hours. Place logs in baking dishes such as Pyrex 9x13 inch pans (so fat drippings will not spill over into the oven). Bake in a 300° oven for 2½ - 3 hours. To freeze Summer Sausage: Allow baked summer sausage to cool completely. Wrap in parchment paper, then with plastic wrap. Place in a freezer bag, storing in freezer for up to 2 months. As if it wasn’t already wonderful news that we can enjoy healthy summer sausage – it’s even better news that this will be perfect for your Make-Ahead Lunch Box. I’ll be packing this for road trips, for sure. Share with us! What’s your favorite holiday finger food? Curious if you think this recipe would work without using the liquid smoke? I have questions about the safety level of liquid smoke. Do you have conclusive research about it, particularly the brand you recommended? Good perspective! I had only recently learned of the carcinogenic properties of liquid smoke, but in this fallen world, perfection is impossible. We will enjoy this summer sausage recipe! Thanks for sharing! Thanks so much for this!! We just butchered a beef and I wanted to have some bologna made but didn’t want all the extra ingredients. I am excited to give this a try. I too have 4 boys and this is one snack/ simple lunch that is a staple in our household!! This is great! 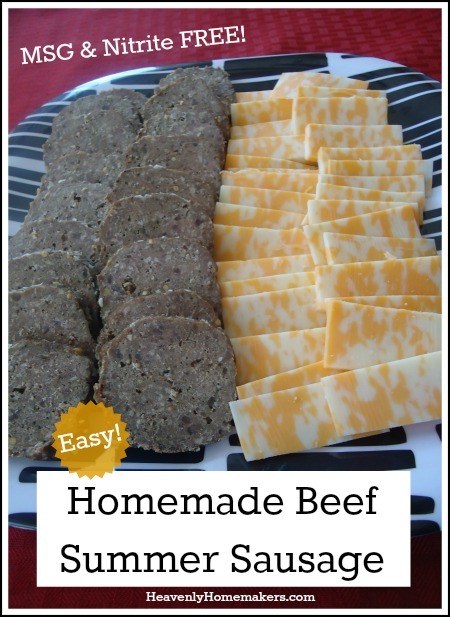 My boys love summer sausage with cheese and crackers, but I always cringe on the occasions we have it because of the processed additives it contains. I’ll give this version a try! So glad you found a way to make it homemade – thank you! This brings back such memories! My grandma made something similar to this every year at Christmas, only she used curing salt, of course, and refrigerated/mixed the meat for 2 days before baking. She called it salami, and I have her recipe, but have hesitated because of the salt. I think I’ll give this version a try this year. Thanks, Laura! Thank you for this wonderful recipe! I love sausage, but, never eat it because of nitrates/chemicals. Now I can make it healthy! Do you think this would work with deer meat? We don’t eat much beef because my husband hunts/processes deer and that is our ground, roast and steak meat throughout the year. It is less fatty than beef, so not sure if that would effect the end product? We have had some summer sausage made from deer meat in the past, but would be interested in making my own. Thanks! I have a similar recipe passed on by a friend years ago. It uses a different salt. Anyways I know she mentioned mixing 1/2 cheap ground beef and deer meat since her husband hunted. I have never tried it so experiment. She also said not to use super lean ground beef when doing it straight beef. This looks great! Do you think it would work with ground turkey? We don’t eat any red meat due to a severe allergy in our youngest son. I know he would love to have some summer sausage. I believe it will work great! We substitute ground turkey for everything! Yes!!! I’ve been avoiding summer sausage since I’m pregnant, but it’s one of my cravings! I will be trying this, this week!! I gave this recipe a try this week and it is WONDERFUL! Everyone in this family loves it. I may need to make another batch soon! Thank you, Laura! Can’t wait to make this! I don’t have mustard seeds, just ground mustard. Would I be able to substitute? Do you know how much sodium would be in a serving. We have to be careful about sodium. Heart problems. You mentioned that you learn from readers who have enjoyed your recipes, so I thought I’d share my happy experience and tweaks. Gently mix water and spices in a glass (or non-metal) bowl. Add meat and squish just until all combined (not too much, to avoid tough meat). Cover and refrigerate 72 hours, stirring after each 24 hours (creates a better flavor and smoother texture–less like hamburger). Shape into logs. Set logs onto long piece of aluminum foil, shiny side towards meat. Pierce holes along one side of log (to allow for seepage of fats from log while baking) and place over cooling rack in a rimmed baking pan or on a broiler pan. Bake at 200 degrees F for 6-7 hours, until internal temp. of 160 degrees F.
Meat came out delicious, smooth, and even a bit pink (because it was not overcooked). It sliced like a dream, and the WHOLE family –all seven of us–loved it! That was a relief, since I had doubled the recipe to make 5 logs! THANKS again, Laura! Love your wonderful helps. God bless you! Oh! I forgot to include an important tip: once the meat is placed on the aluminum foil, roll it up like a log and then grasp the ends and twist HARD (like a candy wrapper), which will compress the meat and plump it up into a nice, rounded loaf. Just wondering how long you have to eat it after cooling (before it would spoil?? Also, how long after thawing from freezer would you have to eat this? We leave ours in the fridge for up to two weeks (not that it usually lasts that long! ).